"Summer running had me a blast." Wait. That's not how the song goes? The summer heat can be brutal for the dedicated runner. Here in Fort Worth, the temperatures reached 110 last week. It has been one of the hottest summers on record. What's a runner to do? 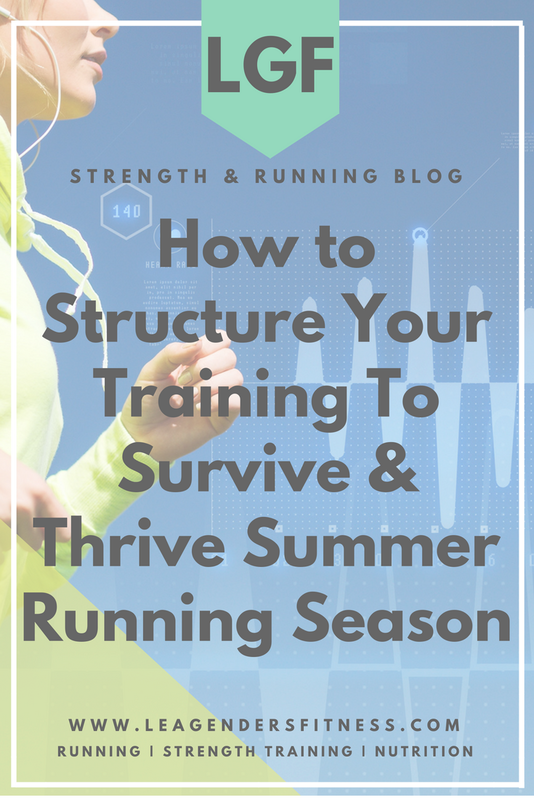 How to structure your training to survive and thrive in the summer running season. Save to your favorite Pinterest board for later. First of all, be safe. Heat stroke is no joke. If you choose to run outdoors in the summer, it's best to schedule those runs in the early morning hours or after the sun goes down in the evening. Stay hydrated throughout the day. It's not enough to only drink water right before you run; Hydrate early, hydrate often. If the heat and humidity are extremely high, take your runs indoors or take a rest day from running. Lower your intensity. Remember that running outdoors in the heat will require you to slow down your pace. Don't be attached to your GPS stats, slow down in the heat and reduce the mileage and time in the sun during hot days. Expect to run 30 seconds to one minute per mile slower in the heat. It is normal and expected. Don't let your ego dictate your pace. Summer is the perfect opportunity to change the focus of your workouts to get stronger for fall training. You can spend time in the summer working out indoors to get ready for winter races. Even if you are not dealing with extreme temperatures, it's still a good idea to change up the focus and structure of your workouts periodically. If we do the same types of workouts month after month without progression, then our bodies adapt, and those exercises become less effective. To increase fitness, break through plateaus, and get the most out of your summer workouts, consider changing your primary focus to strength training, specific for runners, in the summer months. When the beautiful fall running weather arrives, you'll be stronger and better positioned to train for late fall and winter races. I would recommend to maintain your running fitness by scaling your running miles back in the summer, but not stopping altogether. Swap a couple hours per week on the streets for time in the gym, just temporarily. Don't worry, I'm not suggesting you retire your running shoes to become a gym rat, just shift your focus for a couple of months. If you usually run four days a week and strength train two, try swapping those days. Alternatively, if you usually run for an hour, considering cutting your run time in half and using the remaining time for strength training. If you're not strength training at all, it's a perfect opportunity to swap some of those running hours with strength training hours. Don't worry, we'll get back to running as our primary goal and strength training as our secondary in a couple of months. Strength training for runners is different than strength training for bodybuilding. Runners need to perform exercises to keep us healthy and balanced in all planes of motion. We need to build a strong core, which includes the back to power our stride and support our running form. We need balance and single-side training. The key is to look at strength training as something that will improve your performance, not something that will take you away from running. Balance is an essential skill for runners. We alternate our balance on each leg for the duration of our runs. Runners can improve their performance by training unilaterally (one leg at a time) to improve individual leg and hip strength and balance. Examples of balance and unilateral exercises are lunges, elevated split squats, single leg squats (advanced), and single leg deadlifts. Most people think of core training as a way to develop six-pack abs, but core training includes all the muscles in your torso below the chest and above the thighs, including your hips and back. Your core is what keeps your running form stable, especially once you start to get tired during those long runs. A strong core powers your stride and provides stability. Core exercises include planks, side planks, bridges, Superman, and hip exercises. The goal of strength training for runners is to train to become a well-balanced runner. Strength training can help us avoid muscle imbalances that can lead to injury. If we run (and don't strength train), the muscles we use to run get stronger and take over some of the work of the weaker muscles. Over time this can cause alignment and recruitment problems. The muscle stabilizes the joint, so weak muscles can leave you at risk for joint injuries. Weak hips are a big cause of injury in runners. Strong hips keep your pelvis steady when you run. It's essential for runners to train in the frontal plane, lateral movements, because when we run we only move in one direction, forward. To avoid muscle imbalances we need to include lateral training in our workouts. Walking planks, hip adduction and abduction, side lunges and banded side squats are all essential frontal plane exercises to include in your strength training for runners programming. Train stabilization between the upper and lower body with rotational training. This is important for runners because when you pump your arms the energy is transferred through your core to power your stride. Exercises like lift and chop, side plank with rotation and lunge with rotation are great additions to a runner's strength program. Power exercise movements are executed with explosiveness. Runners can use plyometric exercises like bounds, jumps and marches to build explosive strength that can translate to faster running times. Form is of utmost importance in power exercises. For example, when performing jump squats perform each rep with explosive power but rest as much as needed between reps to ensure proper form, rather than rushing through the moves. strength training for runners, click through to download. You can download my quick strength training for runners guide here, no email address required for download. Did you like this post? Do you know someone who might benefit. It helps me when you share with your friends and followers on social media.